Bring on the Tacky Table Runner! 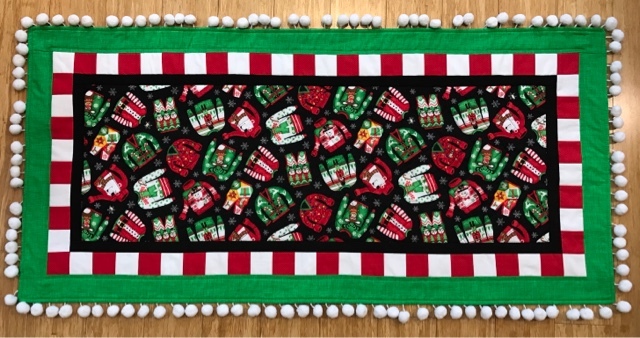 A while ago, I was asked by the folks at Timeless Treasures to come up with a project for a tacky table runner that features their Ugly Christmas Sweater fabric. With LED lights and pom poms, this epic project certainly falls into that category! This project makes me laugh, and let's be honest, sometimes a good laugh is what we need. 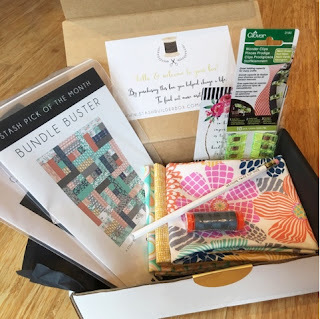 I got to check out the August Stash Builder Box! In the interest of full disclosure, this box was provided to me at no charge. However, my comments and opinions of the product and contents are my own. You may have seen my post on Instagram about the August 2016 Stash Builder Box (SBB) that I was given the chance to check out, so I wanted to give you more details about it. 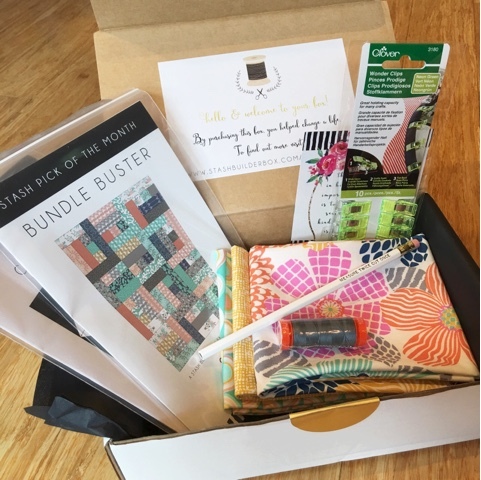 Before I get into the contents, Stash Builder Box is a subscription service that sends a box out every month filled with sewing/quilting related goodies. They offer plans for month to month all the way up through annual plans, so there are a lot of different options. You can read about the options here. If you like the specific box that I am featuring, you need to sign up on their site before August 14, 2016 at 9pm MST. With that said, let's dive into this! The included goodies in the August SBB! My love of Aurifil thread is well documented. 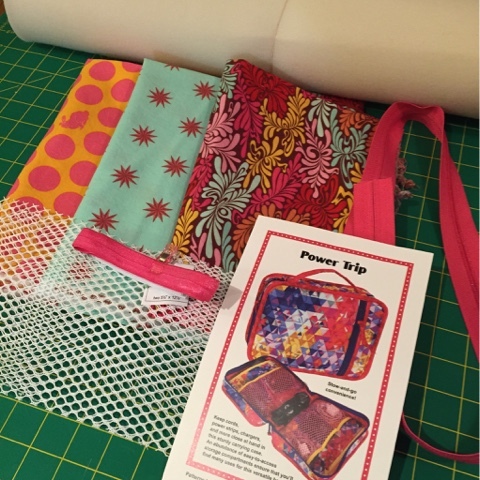 I use the 50 weight thread for a variety of applications including quilt piecing, making smaller items (pouches, etc), quilting, hand piecing (the small amount of it that I do), and binding. In addition to it being my favorite cotton thread, the spool included in this box is GREY - one of my favorite colors. The spool included in my box was color 1246 (appropriately named Grey). It's a nice medium-dark grey that will blend in well with a lot of my projects. There is also a 10 pack of Neon Green Wonder Clips by Clover. I use Wonder Clips for so many things. 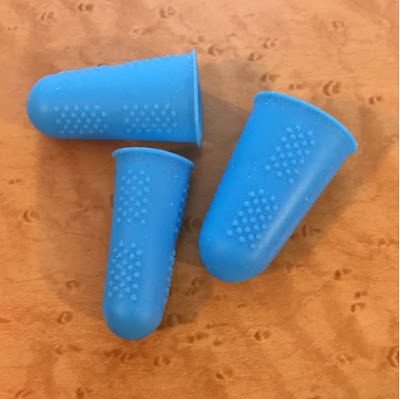 I use them in place of pins when I'm sewing with leather, vinyl, or other materials that pins may irreparably damage. They are also great for holding my quilt or bag binding in place while I'm hand finishing it. Have you ever bent a pin trying to pin through a lot of layers or through heavy fabrics like canvas? I have bent more pins than I want to even think about. Wonder Clips are great for keeping bulky items together. In the way of fabric, this month's box includes 3 fat quarters from Dear Stella's Junebug collection. I loved this collection the first time I saw it. Two of the prints are specific to Junebug and the 3rd is a Dear Stella Basic from their Net collection. I've used Net in quite a few projects, and it's one of my favorite basics. I really like how the team at Stash Builder Box gives its followers a chance to vote for the fabrics that will be included in the box. One of my favorite prints wasn't in final selection, but one of the ones for which I voted did make the cut (the turquoise Demi Circles). It's a great idea to get those of us involved that are "playing at home." One of my favorite sayings as it relates to a variety of projects is "measure twice, cut once." Though I sometimes find myself in the measure twice, cut once, curse and repeat group, it's something that I try to really be diligent about following. Accuracy is key for a lot of the projects that I do. The pencil included with this month's box really resonates with me. There are a pair of patterns inside the box. 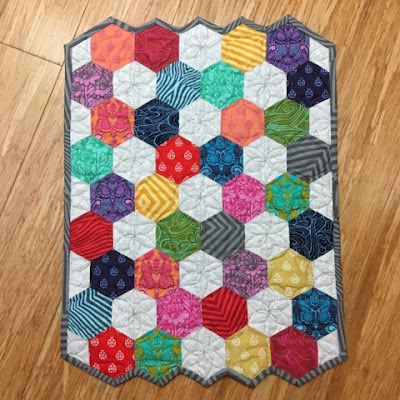 The first is the Bundle Buster quilt pattern from Quilting Jetgirl (I follow her on Instagram) to make a fat quarter friendly quilt that finishes at 60" x 80". That's pretty similar in size to most of the quilts that I make, so it's right up my alley. I have a bunch of FQ bundles that are begging to be sewn into something cool, so this pattern in on my to make list. 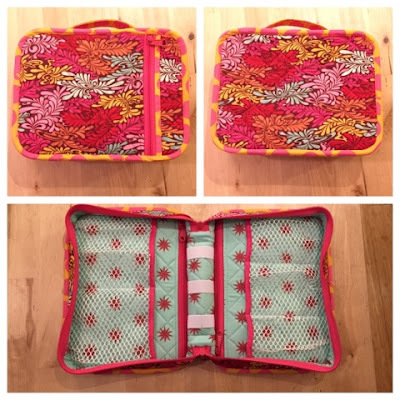 There's also a pattern for the stash block of the month. Finally, the box includes a card that features a quote on one side (this month has a quote from Henry James) and a list of the box's included items on the reverse. Whoever said that something can't be functional AND pretty at the same time! In addition to all of the lovely items included in the box, the thing that I really like the most is knowing that one of the missions of the box is to give back. You can read more about it on the Heart Builders page (SBB does cycle through different organizations so I don't want to get into too much detail). There are so many groups that are in need, and I think it's a great way to have a positive impact in the life of somebody else. So, that's about it from me. I want to take the opportunity to say thanks to Amanda from Stash Builder Box for sending me a box to check out. Again, I want to remind you that the opinions stated here, for better or worse in some cases, are my honest opinions. I'm highly opinionated and quite unwilling to sacrifice my own integrity or beliefs just to get stuff. I won't do it. It's not who I am. To say that life has been a little crazy would be an understatement of massive proportions. 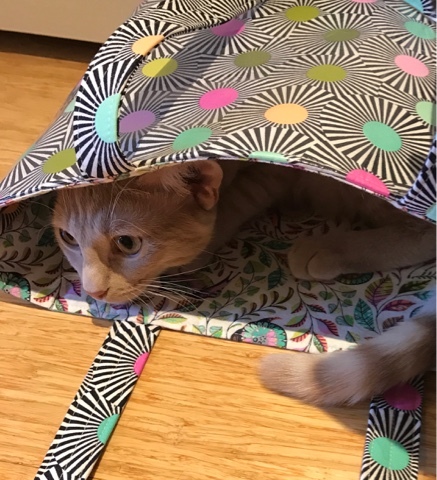 From high points like meeting online friends face to face and attending Spring Quilt Market to the low points of losing both of our beloved feline children (our boy was 14 and our girl was 20), the last year has been a blur. In addition to the pattern testing and editing work that I've been doing, I've also traveled to Ann Arbor, San Diego, and Salt Lake City in the service of following my sewing dreams. I've met some truly amazing people, attended some super cool classes, and I couldn't be more thankful to have the support of my friends and family. There are so many positive aspects of having the opportunity to work within the quilting industry, but the downside is that I can't share most of my projects for months after they've been completed. Trust me when I say that there's nothing that I'd enjoy more than being able to tell you about some of the cool things on the horizon, but I really can't spill the beans. They aren't my beans to spill anyway, and I'm not willing to risk my relationships to satisfy your curiosity. I apologize if that sounds harsh, but I have entirely too much respect for the people that I'm working with to compromise my own integrity and beliefs. Plus, it's pretty cool to be in on some of these secrets. So, that's that. With less than 3 months to go before Fall Quilt Market and a pair of kittens to now worry about, my intermittent disappearing act will almost certainly continue. 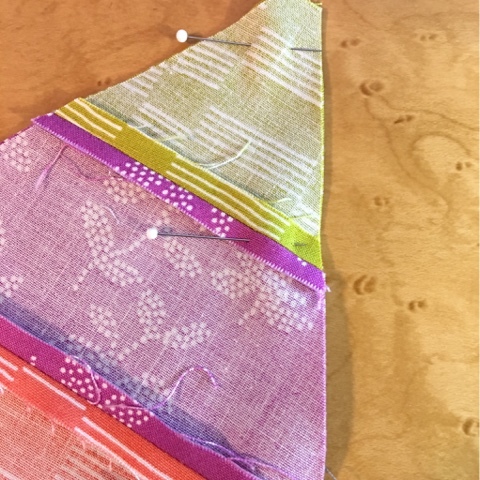 When I was recently at a quilt shop, I was asked about how I get really good results with matching points on my quilts, especially when using specialty rulers. I fully admit to my mild (yeah, who am I kidding) obsession with rulers. My most frequently used specialty rulers are probably my Jaybird Quilts Sidekick Ruler (both regular and Super sizes) which can be used for cutting 60 degree equilateral triangles / diamonds / half triangles and the Jaybird Quilts Hex N More Ruler for cutting hexagons / half hexagons / triangles / jewel shapes. I love both of them for the variety of shapes that they can cut. I also love just about any ruler made by Creative Grids. Now, on with my tips. The key word to success, in my opinion, is accuracy. So, how can you really achieve that? This might seem really obvious, but I know for a fact that not everybody does it. If your fabric is wrinkly, your cuts will almost definitely wind up being inaccurate. I loathe pressing, but it really does make a difference. Set yourself up for success and take the time to do it right. You may also consider using starch or a starch alternative to help better manage the bias edges. I can honestly say that I don't use a lot of starch/starch alternative. This is due, mostly, to my allergies. Starch (think of the cans of spray starch that you may have seen your grandma using) gives me a rash and/or hives, so I usually opt for a product like Flatter by Soak or Best Press. I prefer Flatter if you are curious. I find the scent (even the unscented) to be less overwhelming, and I like that they list the ingredients. If you are going to use starch, you will want to do this before you cut the fabric as starch can make the fabric shrink. I absolutely cannot stress how important it is to be accurate with your cuts. This starts when you make your first cut. As an example, if the pattern tells you to cut strips at 2.5" wide, make sure they are 2.5". 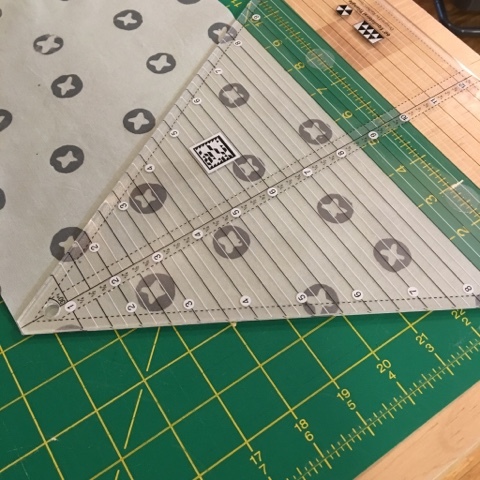 If you are using manufacturer precut fabric, you will want to measure the strip and trim off any excess (I've seen strips that are closer to 2.75" in a precut pack). Yes, I realize that pre-packaged fabric might say that it measures 10" square, but it isn't always the case. I know that it isn't ideal, but it's reality. Many of the patterns that I have made begin with strips of fabric of varying sizes (I've used strips that may be as narrow as 1.25" or as wide as 12.5"). Once your strips are the right size, you can proceed to cutting out the appropriate shapes listed in the pattern. Whether cutting pieces with multiple bias edges (a triangle, for example) or simple squares/rectangles, why would you not want to give yourself a higher chance of success by starting off on the right foot? In the following 2 pictures, you can see that my strip is lined up with the top edge of the ruler and at the 8.5" line that the pattern specified. With the left edge also properly aligned, I am ready to cut the other side of the triangle. Note the alignment on all 3 edges of the ruler. Some patterns may require the use of templates or rulers. I prefer rulers because I find them to be substantially more time efficient for cutting and cost effective because you don't have to spend time tracing out each size on template plastic (and inevitably re-tracing because I've lost one piece or cut through it accidentally). Plus, I can cut way more accurately using a precision cut piece of acrylic and a rotary cutter rather than by tracing a line. Try as I might to make my cuts perfectly, I'll be honest, I've had some pieces wind up being a smidgen off. Can I make it work? It really depends on how far off I cut it. If the pattern says to it your strip at 3.5" and you cut it at 3.25", it probably won't work. I don't normally pin every few inches with most of my sewing, but I do place a pin perpendicular to my seam at intersections where lines will cross. This will hold the fabric in place. I do NOT advocate sewing over pins. It can be dangerous to do so. I like to sew close to where my pin is before I remove them. This piece had 4 pins in it. One at both the top and bottom and one at each of the seam intersections. Note that my pins are perpendicular to where the seam will fall. Don't iron. Press. Ironing is often done with a side to side motion that can quite easily distort your pieces, especially since many of them have bias edges. Many of the newer quilt patterns instruct you to press your seams open. This is a very important step and you shouldn't ignore because you were taught solely to press to one side. Why does this matter? Unlike some of the simple, traditional quilt blocks with only 2 sets of seams at an intersection, you may find yourself with 4 or 6. Pressing your seams open will reduce the bulk and make them easier to sew and quilt. Yes, that means that your seams won't nest like you may be used to, but that isn't necessarily a bad thing. It's just different. Again, the purpose is to reduce bulk. Pressing seams to one side can also unintentionally lead to shrinkage. I'm a big fan of pressing with steam, but you have to be extra careful about using steam if you tend to iron. Using steam plus ironing (not pressing) can be a disaster for accuracy. Also, since you are pressing your seams open, take extra care to not give yourself steam burns (they REALLY can be painful - ask me how I know this). There are some great tools that are available for people like me. 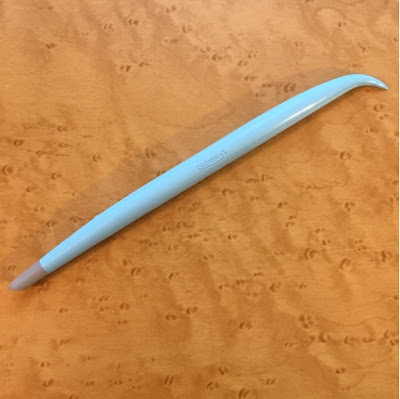 The Hold It Precision Stiletto by Joan Hawley (Part of the Clover Press Perfect collection of notions). This handy tool can hold your seams open while you are pressing. Dritz Thermal Thimbles can be worn on multiple fingers and can shield your fingers from some of the heat. These are not a total heat shield, but they are WAY better than naked fingers. The only negative aspect to all of this is time. A few seconds here and a few seconds there can add up. It does take a little more time to do things like make sure that your fabric is pressed, it takes more time to cut your fabric, and it takes more time to stop and pin, but it's worth it for me. In the end, I'm happier with the results. Does that mean that you can't make one of these projects quickly? Absolutely not. If you are really in a crunch for time, think about the pattern and consider selecting a less complex pattern or making a different size. Bias edges can easily stretch, so I try to keep my handling to a minimum. If you don't need to keep grabbing your pieces, why do it? Hang them on your design wall, leave them in a stack, or store them together in a box. The geometric nature of these patterns depends on shapes fitting together properly. Shrinking or stretching out the pieces can have a cascading effect as the blocks are assembled. 2. Don't fear the ripper (Yes, I totally said that. I'm very punny, you know). Seam rippers can be your best friend. I will admit that I'm a little OCD about my seams matching, but it doesn't always happen for me the first, second, third time, or ever. If I have a section that is slightly off (and I know that it will really bother me), I will usually rip the stitches out for about .5"-1" on either side of the mismatched seam. If it's off by more than that, you will probably need to remove additional stitches. One thing that I do try to tell myself is that some of my "less than ideal" seams will be hidden by quilting due to shrinkage of the fabric/batting or they may even be covered by thread. It's also important to think about the integrity of the fabric itself. If you are ripping out stitches, the fabric can only recover so much from the stress. With high quality quilt shop quality quilting cotton, the most that I will ever rip something is 3 times. If it still isn't fixed, it stays. Accuracy is often the first to suffer under the crunch of time. It can also be helpful to tackle some of these projects in stages. Maybe you press your fabrics before cutting on one day and cut the following day. You don't have to sit down for a single marathon session (unless you happened to be a procrastinator and waited until the day before you had to have it done). The more you make, the better you will get. Techniques become second nature and you become more comfortable and relaxed with the process. I think this really comes through in your sewing. Most of the specialty rulers that I've purchased have a set of written instructions included. While I don't find that I refer to these on a very regular basis, they can be very handy when you are cutting a different shape or if you haven't used the ruler in a while. I keep all of my ruler instructions together in a clear bag. 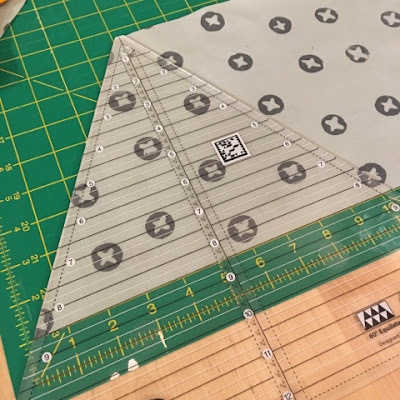 There are some great videos on the Internet that demonstrate how to use quite a few of these rulers, but sometimes going back to the printed instructions can be faster. Now you've heard my tips, go forth and make awesome stuff! 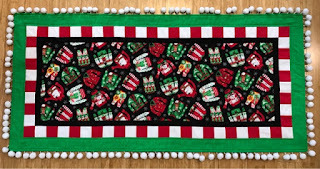 For those of you in the Seattle area, I will be teaching the Jaybird Quilts Mini Delight pattern at Gossypium in Issaquah on Wednesday, March 23 from 11am - 2 pm and again on Saturday, March 26 from 10:30 am to 1:30 pm. There are still seats left in both classes, and the class fee includes the pattern! If you want to see the quilt in person, it's currently on display at the shop. You can sign up on gossypiumquilt.com, call the store at (425) 557-7878, or stop in during business hours. As you may have read in my post that briefly mentioned Quilt Market, I had the opportunity to make a bunch of LBG Studio's The London Backpack for the Dear Stella booth at Fall Quilt Market 2015. Each bag featured fabric from a different collection. After making 8 of them, I feel like I know the pattern pretty well, so let's get on with my review. My first impression of the pattern was quite positive. I liked the shape of the bag on the pattern cover, and the picture on the following page that shows the size on kids and an adult. With an approximate finished size of 12" tall x 13" wide x 5" deep, I would certainly call this a purse-sized bag rather than the jumbo size version that springs into my head when I hear "backpack." 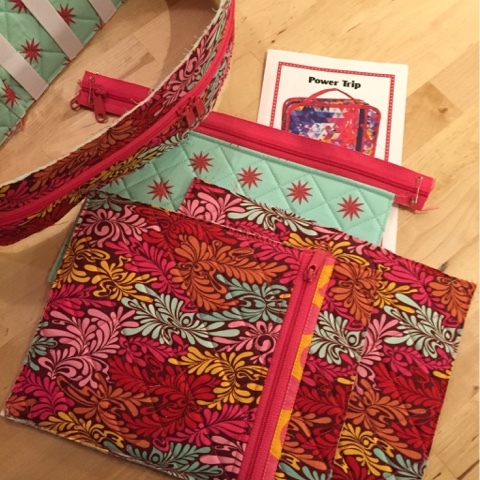 This pattern has a magnetic snap flap that covers a drawstring. There is a zipped pocket on the interior of the bag, as well as one on the back side of the exterior. Like the Senna Tote (also by LBG Studio) that I previously reviewed, the materials list recommends duck cloth/cotton canvas for interlining (I used a 10oz 100% cotton duck). Fusible fleece is listed as an alternative, but I don't think I would be as happy with the finished project. The majority of the pieces for the pattern are rectangular, so I LOVE that the dimensions were provided so that the pieces may be rotary cut instead of using pattern pieces. This saved me from having to print a bunch of extra pages that I wouldn't use. This pattern marks the first time that I've used grommets (the pattern says eyelets, but you really want grommets). To be honest, it was a little nerve-racking to put them in, but it really gives the bag a professional looking finish. I found a good tool for punching the holes plus a grommet setting kit at Tandy Leather. As a side note, the pattern calls for eyelets. Eyelets look different from the back than they do on the front. in addition, eyelets are usually smaller (at least that's what I noticed when I was trying to find the hardware). Grommets look the same on the front and the back. With the hardware being clearly visible, grommets are going to give you a uniform look. Yup, it's a grommet. It really gives the bag a professional look. As far as construction goes, you will be working with heavy materials that are also thick, so I will definitely also recommend using a jeans needle. You might also find it beneficial to slightly increase your stitch length and take it slowly. The single most frustrating part of the bag for me was sewing the exterior bottom piece to the sides. There is a fair amount of easing that needs to happen, and the rigidity of the duck cloth can make it a pain. I used a ton of Clover Wonder Clips, and I'm pleased with how they turned out. These clips have a lot of different uses. One of them is take the place of a straight pin. Putting a needle through layers of interfaced fabric and duck cloth isn't going to turn out well for your pins, so I use the clips instead. I can't say that I really made any modifications to the pattern other than using a 3rd fabric as an accent on the flap and bottom at the request of the lovely folks at Dear Stella. To do this, you will need to add an extra fat quarter or a 1/3 yard (1/3yd x WOF) of fabric from the bolt of the fabric that you wish to use as your accent. When cutting out your fabrics, just don't forget that you are using the accent fabric! Now for the real question - would I make it again? Yes, I would absolutely make this pattern again. It's well-written, and it makes an awfully cute bag. Want to see more pics from the Dear Stella booth? You can check out their recap post here. Today, I thought I'd share my thoughts and write a review on the Power Trip Case by Patterns by Annie. This one has been on my to do list for a while, and I thought that my trip to Glamp Stitchalot in Michigan would be the perfect reason/excuse/justification to go ahead and make it. If you have been following me, you will not be surprised that I picked another one of Annie's patterns. I think they offer the perfect balance of functionality and usability, and I don't think her Soft and Stable products can be beat for durability, stability, and giving your bags a nice, professional finish. Also, this bag would be a great gateway project for somebody that's thinking about making Annie's A Place for Everything bag. Some of the basic construction steps are very similar. I've written a pretty lengthy blog post on it. 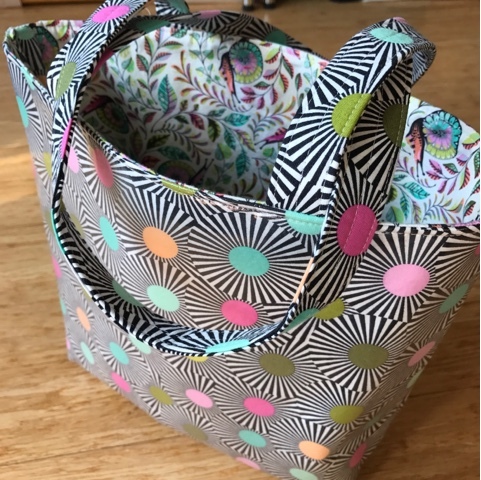 There are also some tips and tricks in there that you may find handy when making this bag too (especially the part about trimming back the Soft and Stable when installing the zippers). This bag finishes at approx 7.5" tall, 10" wide, and 3" deep (if you are holding it in your hand by the handle). 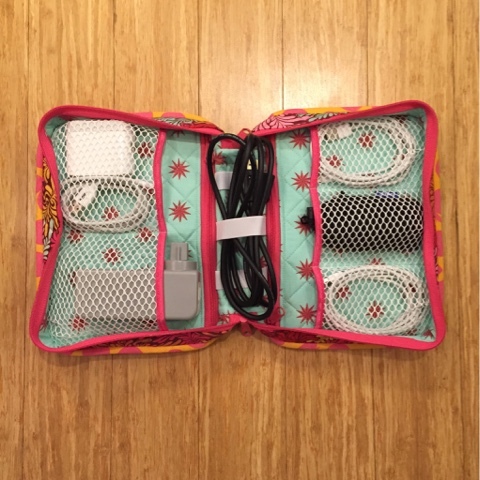 It features 3 zipped pockets (2 interior and 1 exterior), 5 open mesh pockets, and 1 section with elasticized loops (in the center of the case along the inside of the spine). For mine, I picked one of my favorite fabric combinations (yes, again) - Tula Pink MoonShine + Tula Pink Fox Field with white mesh, white elastic, hot pink fold over elastic, and Annie's handbag zippers in the lipstick color. Like most of Annie's other patterns, you begin by quilting a sandwich of Soft and Stable with your main and lining fabrics. 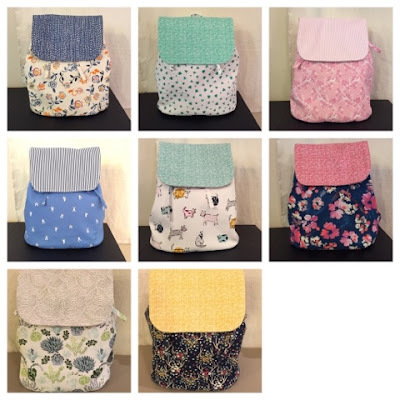 Once quilted, you cut the pieces into the sizes listed in the pattern and begin to assemble the bag's components. 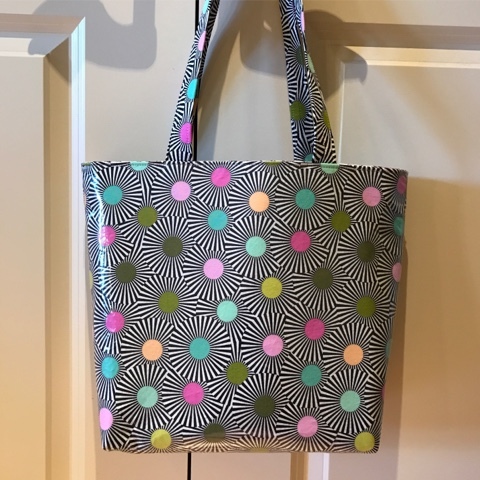 One cool option that you can do with this bag is pick if you want to see more of the lining fabric or more of the exterior fabric on the inside of the bag. It's as easy as flipping a piece over. Not sure what I'm talking about or why you might take this into consideration? 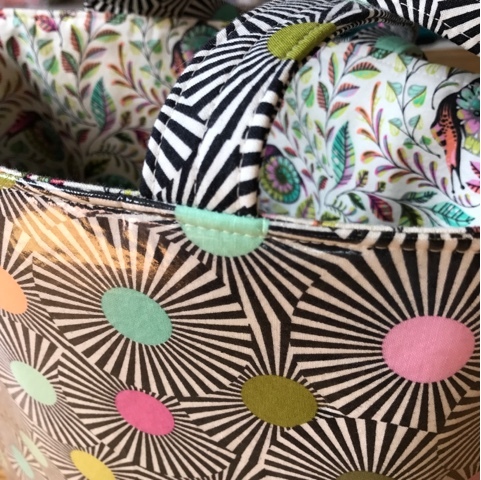 If you look at the pictures that Annie shows of the pattern on her website, you can see that some of the examples have the interior fabric facing outward on the interior and some have the exterior fabric. While it isn't technically a functional issue, I think it's more of an issue of usability. For my bags, I prefer to use the fabric that will allow the mesh to "disappear" into the background more. Using the aqua print allows the white mesh that I picked to be as visible against the fabric. I don't want the mesh to be a star of the show, I'd rather see the pretty fabric! I also prefer to use a less busy print for my lining fabric so the contents of the pockets are easier to see against the lining. I decided that I wanted to modify a few things on the pattern to make it work better for me. These are not major changes, and do not have much of an impact on how the bag is constructed. When making the bag, one common modification for me is to hand stitch the zipper side strip binding. Why do I do do this, you ask? 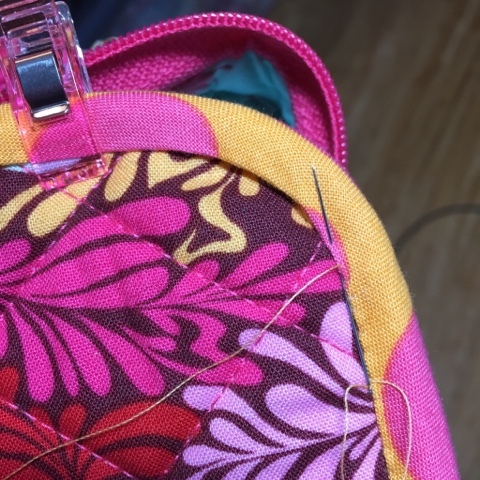 By hand stitching them down, you don't run a line of stitching through the visible part of where the handle is attached on the center side strip/spine of the bag. It's really an aesthetic choice more than anything. The largest modification that I made is in how the pockets are installed. In the pattern, the mesh pockets are open toward the zipper of the bag not toward the spine. Why did I decide to do this? Ah, good question. It's all about how the bag will be carried. With a handle on the spine of the bag, installing the pockets as the pattern instructs means that the pockets will be upside down when carried. Even though the items wouldn't have very far to go if they started to slide out of their pockets, it's not unrealistic to expect that could happen. One thing to think about if you are considering making this same modification is the zipper pockets that are below the mesh. The zipper pockets may be ever so slightly more difficult to access if you have a thick cord (like the black cord in the picture below). It's easy enough to work around the issue, but I think it's worth the little bit of extra effort for how I knew I'd be using the bag. To do this modification, you just rotate the assembled zipper pocket/mesh pocket units 180 degrees. 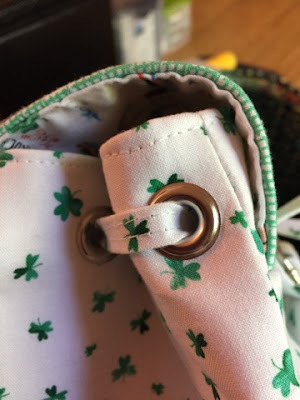 Using Clover's Wonder Clips to clip the pieces together and do a quick assembly test can be very helpful to ensure that the pockets are oriented properly. Loaded up and ready for my trip! One of the things that I almost always do to give my bags a really clean finish is to hand sew my binding like I do on my quilts. If you want to do this, I recommend attaching your binding on the zipper side of the bag and hand sewing it down on the exterior panel. Be sure that you are using the 1/4" seam allowance as mentioned in the pattern and that you are using bias binding. You want the binding to be nice and smooth. 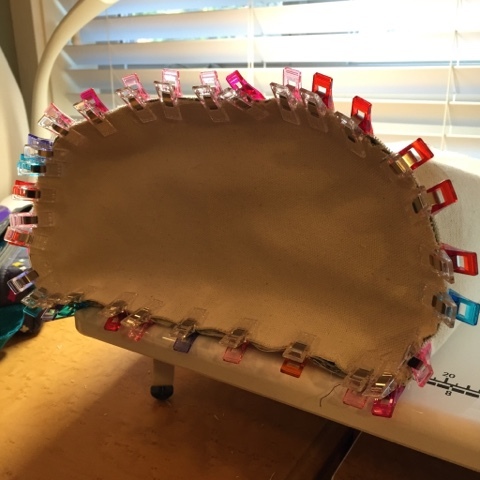 Wonder Clips, as mentioned in the pattern, are one of my favorite tools to hold your binding in place as you stitch it down. Even though it takes a lot longer to finish, I prefer the look of the hand stitched binding. To recap, I think this is a fantastic bag. It worked very well for me on my trip. If I planned to make this bag again, I think the only change that I would make would be to omit the stitching that holds the center down on the elastic installed into the spine of the bag. In fact, I might even grab my seam ripper and remove those few stitches as soon as I post my review.